1) Place 40g of the pistachio nuts into a blender or food processor and blend until fine and roughly chop the remaining pistachio nuts. 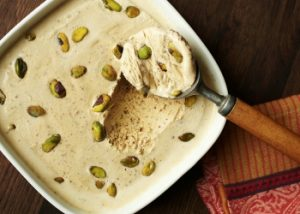 2) Pour the condensed milk and double cream with the finely ground pistachio nuts into a large bowl and whisk until thick and quite stiff. 3) Fold in the chopped pistachio nuts, then pour into a freezer proof container and cover. 4) Place in the freezer for a couple of hours or overnight. And there you have it! Delicious no-churn ice cream.